Polish stage designers today despise the word ‘decoration’. These artists don’t merely provide embellishment for theatre productions – they create breath-taking, autonomous worlds for artists and audiences alike to explore. Culture.pl presents some of the most interesting stage designers working in Poland today. Anna Met frequently works with women directors. Since the beginning of her career, she has worked with Natalia Korczakowska, but she has also designed productions directed by Anna Smolar, Grażyna Kania and Anna Karasińska. Met’s credits include collaborations with other notable directors such as Iwan Vyrypaev, Paweł Passini and Marek Kalita. The designer graduated from the Academy of Fine Arts in Warsaw. Met was awarded the main prize of the Klasyka Żywa (Living Classics) competition for her design for Bramy Raju (The Gates of Paradise) at the Współczesny Theatre in Wrocław, directed by Passini, as well as for Przedwiośnie (The Coming Spring), directed by Korczakowska at the Wybrzeże Theatre in Gdańsk. Met’s opera debut, also with Korczakowska, came in 2011, when she designed the set and costumes for Jakob Lenz by Wolfgang Rihm, staged at the Chamber Music Hall of Warsaw’s Wielki Theatre. There, she also collaborated on the design for Korczakowska’s production of Halka by Moniuszko. Met creates attractive, aesthetically consistent stage-worlds, adopting a variety of stylistic approaches. She also displays brilliance in designing for a younger audience – consider her unusual, slightly disturbing house of mirrors for Cinderella, directed by Smolar. But Met is equally accomplished when it comes to new takes on the classics. For Uncle Vanya, directed by Vyrypaev, the designer built a realistic wooden hut, even ‘planting’ a forest onstage. Met also works with avant-garde approaches, as when she created an outdoor set design for an adaptation of Witkacy’s Narcotics, directed by Oskar Sadowski. In addition to finding solutions for monumental operatic conditions, Met also produces more streamlined work. In the futuristic 2118 by Anna Karasińska, the stage was almost empty – apart from a glistening object that resembled a gigantic, irregular sculpture made of aluminium foil. Thanks to a trick of the light, this simple, minimalistic stage design fostered a fantastical, far-out reality onstage. Michał Korchowiec trained as a painter, but he works as a set and costume designer, as well as a director and on installations and video art. The artist made his name through his long-term collaboration with the director Monika Strzępka – which began in 2009 with Niech Żyje Wojna!!! (Long Live the War!!! ), staged in Wałbrzych. Korchowiec has also worked on productions directed by Jacek Poniedziałek, Wiktor Rubin and Magda Szpecht. In 2013, Korchowiec was awarded with the prestigious Leon Schiller Prize of the Association of Polish Stage Artists (ZASP). His stage design for Courtney Love, directed by Strzępka (2013), was awarded by the Divine Comedy Festival and the 19th National Competition for Staging Contemporary Polish Plays. For this piece, Korchowiec designed a grunge reality of a stuffy, dusty garage, with mattresses and duvets scattered everywhere. The stage was limited by a built ceiling, and the actors treaded their paths in real dirt. Korchowiec is known for his evocative objects – frequently, he works with old furniture – as well as a faded colour pallette and an aesthetics of mess. Think soil or dust on a stage littered with destroyed objects. He also enjoys using chairs and armchairs, which often clutter up the stage picture. But he has also created many frugal, moderate designs, such as his simple, geometrical shapes for productions directed by Poniedziałek. All of my projects constitute a cohesive vision of the world; they can function independently as exterritorial works of art, possessing their own stories. Dorota Nawrot's stage design is a crucial component of Michał Borczuch's theatrical success. The duo has been collaborating since 2012, when she designed The Snow Queen in Wałbrzych. Since then, she has consistently designed the sets for Borzuch’s most important productions, including: Paradiso (2014); the award-winning Apocalypse (2014); All About My Mother (2016), an adaptation of the Pedro Almodóvar film; and Aristophanes’s Frogs (2018). Nawrot has also worked with Wiktor Rubin and Anna Maria Karczmarska. Nawrot also designed Tomasz Węgorzewski’s production of November at the Fredro Theatre in Gniezno, as well as his The Vampire: Trauerspiel at Teatr Polski in Bydgoszcz. While many Polish directors train at the state professional theatre academies, Nawrot is a graduate of the Drama Studies Department at the Jagiellonian University in Kraków – proving that there are multiple paths to success in the field. Apart from the theatre, she also works as a stylist and costume designer for film and commercials. Nawrot's boundless spatial imagination accompanies the abstracted drama often proposed by the directors she so closely collaborates with. She speaks their language, as if together, they constitute one artistic body. Her designs tend to be open, spacious compositions, capable of supporting often non-linear storytelling. Nawrot's projects are free from boundaries, and in no way do they limit the actors. They often, however, sparkle with some of the designer’s own sense of humour. In The Vampire, audiences watched as a prism, splitting the light, was built before them out of crooked blocks. In Frogs, she dressed Jan Sobolewski in exaggerated wedge heels and a swan costume. Apocalypse featured one half of an ambulance driving on stage. A true veteran of contemporary stage design, Mirosław Kaczmarek has collaborated on more than 150 performances. He is a graduate of the Department of Visual Communication at the University of the Arts in Poznań. Kaczmarek frequently works with the director Jan Klata; together, they have created more than 20 performances. The designer also often collaborates with Marcin Liber and Wiktor Rubin. His résumé also boasts productions directed by Jarosław Tumidajski, Maćko Prusak, Agnieszka Olsten, Magdalena Miklasz and Grzegorz Wiśniewski. I considered the theatre archaic. That all changed when I saw ‘Cleansed’ in 2002. This performance made me realise that the theatre was actually a field of endless possibilities. Time passed, and I made my first performance, then the second one, and then some more. Today, it is my main, absolutely favourite, and still most interesting job. Kaczmarek’s style is far from subtle; his projects are often expressive and confrontational. In his effort to engage the audience, he often reaches for meaningful gestures, such as in Towiańczycy: Królowie Chmur (The Towianists: Rulers of the Clouds), directed by Rubin. In this production, he pierced the walls of the stage with hundreds of knives, hammers, sickles and other sharp objects. For a production of August Strindberg’s To Damascus directed by Klata, he created an enormous installation of cages filled with skulls. Another interesting stage design made by Kaczmarek was the one for Everyone Gets What They Believe In (originally: Każdy Dostanie To, W Co Wierzy), directed by Wiktor Rubin. Here, the actors performed on a gigantic, round table, interacting with the audience seated around it. Kaczmarek created the Polish pavilion during the 11th Prague Quadrennial of Performance Design and Space. In 2012, he was nominated for the prestigious Polityka Passport award for theatre. Considering stage design a separate entity is a mistake, because it's an inherent part of the performance. Borkowska has frequently collaborated with the director Maja Kleczewska, and since 2013, the director Ewelina Marciniak. She has also worked on projects directed by Michał Borczuch in both Kraków and Wrocław. Borkowska's work proves her extraordinary sensitivity to the language of theatre. She designs with style, but one that is never over-aestheticised. No mere whims of the stage designer, her solutions fit the projects they are created for. For The Books of Jacob (originally: Księgi Jakubowie) – an adaptation of an Olga Tokaczuk novel, directed by Marciniak – she adorned the stage with exquisite mirrors and dressed the actors in baroque-style costumes. In Tomasz Domagała's words, however, these choices ‘constituted an amazing equivalent of the fantastic world created by Tokarczuk’. In The Death and Resurrection of the World (originally: Śmierć i Dziewczyna), Borkowska recreated a famous Texas chapel, which is decorated with gigantic black paintings by Mark Rothko. She also designed the set for Kleczewska's Shadows (Eurydice Speaks), based on the work by the Nobel Prize-winning Austrian writer Elfriede Jelinek. The actors were surrounded by Venetian mirrors, which reflected lights of changing colour. Borkowska has received many awards, including the Leon Schiller Prize in 2007 and the 2015 Nagrody Teatralnej Marszałka Województwa Pomorskiego (Theatre Prize of the Marshal of the Pomorskie Vovoideship). I despise the word ‘decoration’. To me, it means something dead. In 2011, Skwarczyńska co-created the Polish exhibition of the Prague Quadrennial. She was also awarded the Gold Award of the 4th World Stage Design, another important exhibition devoted to scenography. There, she presented her stage designs for two plays directed by Wojciech Faruga (The Leprous: A Melodrama and Antony and Cleopatra). Skwarczyńska has worked with many directors, including Łukasz Chotkowski, Julia Mark, Paweł Wodziński, Iga Gańczarczyk and Kuba Kowalski. She has also collaborated with Teatr 21. Skwarczyńska considers her creations a space for the human body – one which legitimates their existence. Hence, it is difficult to define her style, as projects adapt to and resonate with a given production and the energy of its performance. The artist is not preoccupied with replicating any signature artistic style. One of Skwarczyńska’s most recent projects was How to Be Loved, a dramatic adaptation of a classic film by Wojciech Jerzy Has, directed by Lena Frankiewicz. The performance at the National Theatre in Warsaw stood out mainly due to the stage design. Skwarczyńska designed a light, geometrical space straight out of the 1960s, both eye-catching and functional – and it came to life the very moment the actors took the stage. 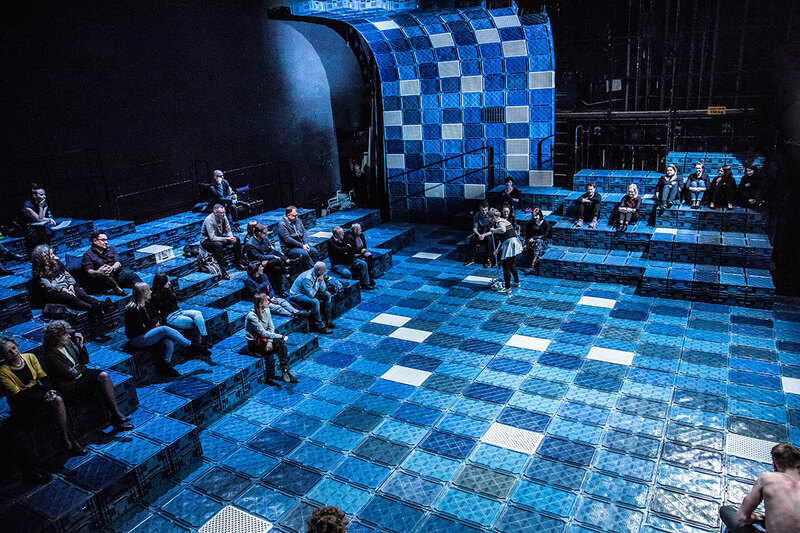 In The Devil and a Bar of Chocolate, directed by Kuba Kowalski, Skwarczyńska created a frugal set made out of plastic boxes, which blurred the lines between the stage and the audience. The designer has plans to seek further artistic inspiration in Iceland, where she will explore the panoply of local textile practices. Originally written in Polish by Marcelina Obarska, translated by AJ, edited by LD, Mar 2019.